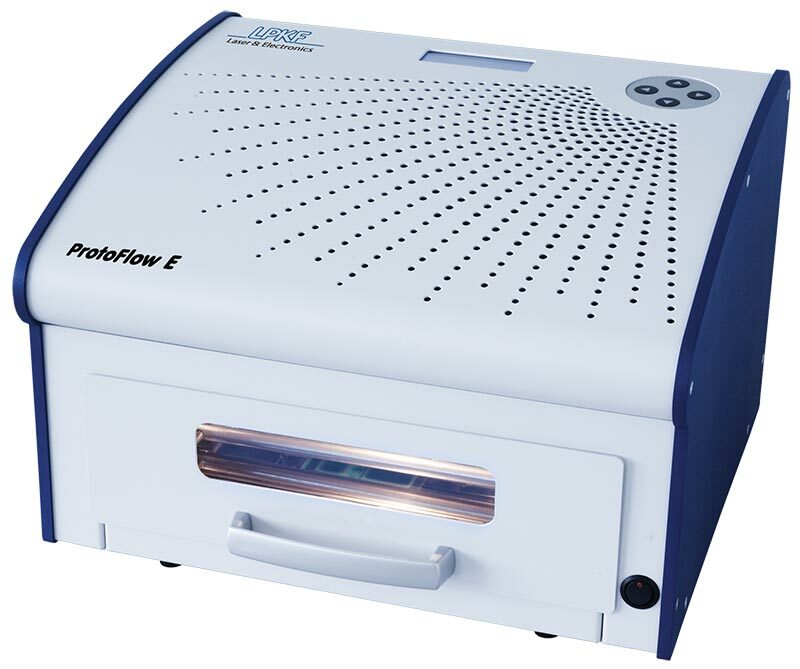 The LPKF ProtoFlow E is a compact, fully convectional and easy to use oven, suitable for lead-free reflow soldering of PCBs measuring up to 160 x 200 mm. Menu navigation makes the profile programming and parameter setting extremely easy, allowing a beginner or an expert to successfully solder a PCB in a few-minutes. Ergonomic design incorporates a four arrow keyboard and a LCD to access all functions of the oven. Manually driven, see through drawer, and the illuminated interior of the oven reveals the current status of the soldering process and allows on-the-fly job modification. The heater design and precisely controlled air temperature provide even heat distribution over the whole PCB surface. Optionally, the ProtoFlow E can be connected to a PC via a USB port for faster and more convenient profiling.